A few years ago, when maxi skirts started to make a big comeback, I was convinced that I could never wear one. I’m only 5’0, so I figured any maxi skirt out there would swallow me up and make me look ridiculous. Until, one day, I tried one on and fell in love. Now I realize that not only can you be petite and wear maxi skirts (they actually can make you look taller if styled correctly), but I know that anyone, no matter what shape or size, can wear them and look good. Maxi skirts are a wardrobe staple for most of us during the spring and summer, but they can also be worn during the fall and winter as well. That’s what’s so great about them – they’re versatile, easy to style with anything, and incredibly comfy. If you didn’t buy one yet, you need to for spring, because there are so many outfits you can create with one. To get you started, here are 20 style tips on how to wear a maxi skirt for any season. 1. Try one of these easy looks for summer and spring. 2. Go for a sporty vibe by pairing a maxi skirt with a graphic tee, Doc Martens, and a varsity jacket. 3. Pair a floral maxi with a basic tee, and layer with a cardigan. Perfect for spring! 4. Wear your maxi skirt with a crop top. Wear it higher on your waist so you show very little skin, or wear it lower to bare your stomach. Whatever you’re comfortable with! 5. Layer a blazer over a tee and maxi skirt for an easy fall or winter look. 6. A chambray skirt looks amazing tucked into a maxi skirt. Cinch the waist in with a thin belt to give the outfit some shape. 7. Pick a maxi skirt outfit based on what’s best for your body type. 8. Keep things super simple by pairing your skirt with a white tee. A fun leopard print belt really stands out. 9. Wear your maxi skirt to a festival or to the beach, and protect the bottom by tying it into a cute knot. 10. Go for a super casual look by mixing basics. Tying the tee at your waist looks so chic and effortless. 11. Kick your outfit up a notch by layering with a jean jacket. This is great for fall or spring. 12. Maxi skirt during the day, cute dress by night. This is a great idea, especially for vacations when you don’t have room to pack much. 13. Wearing a cozy sweater with a feminine maxi skirt looks so good for fall or winter. 14. Try one of these easy styles. My favorite is the blazer – it makes your look more professional and streamlined. 15. Go for a tough but girly look by pairing a pink maxi with combat boots and a leather jacket. 16. Buy one black mini skirt, and wear it a million different ways. 17. 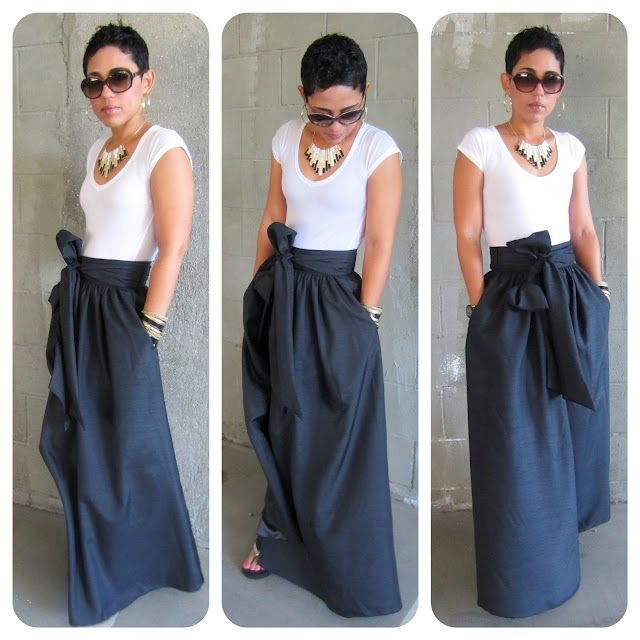 Pairing a simple maxi skirt with a long sleeved shirt and a scarf is great for fall or winter. Love the stripes! 18. Go for a more boho look by wearing a loose, off-the-shoulder tee. 19. Dress up your maxi skirt by wearing it with a button-down shirt and heels. 20. Make your maxi dress look like a skirt by layering a t-shirt over it. Which of these looks is your favorite? Do you have a maxi skirt? How do you wear it? What other style tips do you want to see? Tell me in the comments!